MyCollege Connect is an iPhone app designed and developed for education industry. 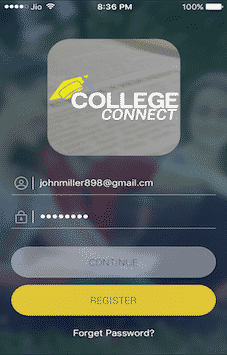 The College Connect App allows students and faculties to communicate via College Connect social platform regarding their courses, classes and student life. 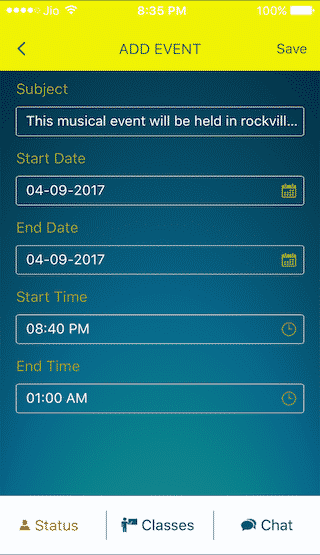 Simpalm has built this app for a Startup in Virginia. This new innovative platform allows students to easily contact fellow classmates and faculty in their university or school. We have developed MyCollege Connect with several interactive features that helps students to communicate, share test dates, deadlines, meetups and one to one chat with other students. Students can create their profile in the app and link it to their college. Student can discover profile of other students going to same college or different college. Students can add programs and classes that they are attending and they can discover students who are attending the same classes. Students can post their status in the app and view status of other students. 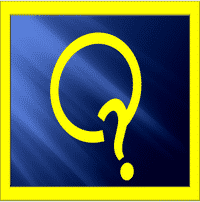 Students can comment on status and be able to set as a favourite status. Students can initiate one to one chat with other students and discuss problems and solutions. Students can receive alerts from app. Students can access calendar and add events in it. Students can edit account details and deactivate account. Students can submit feedback to Admin. Client wanted to build an app that allowed students to discover students with similar courses and problems. We solved this by building mobile app on iPhone, along with a backend database server so that students could create profile in the app, add their academia content and connect with other students. One big challenge in the app was chatting feature, we implemented one to one chat in the app by using our custom chat code to make it efficient. MyCollege Connect has features like Status Posting, Event Creation, Share Deadlines, Meetups, One to one chat and several other capabilities.